Does Nazi Salute Reveal America’s Occult Antecedents? Browse: Home / Does Nazi Salute Reveal America’s Occult Antecedents? 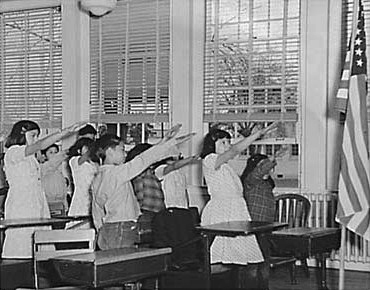 The Bellamy salute is a palm-out salute described by the Freemason Francis Bellamy, the author of the American Pledge of Allegiance, as the gesture which was to accompany the pledge. During the period when it was used with the Pledge of Allegiance, it was sometimes known as the “flag salute”. Both the Pledge and its salute originated in 1892. Long before Hitler youth were saluting and clicking their heels for Der Führer, American children were saluting and clicking their heels for the idol of Lucifer: “Old Glory”, the American Flag.